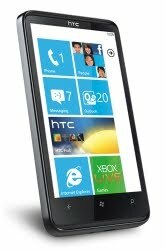 I've had my Windows Phone 7 device for 2 months now and I thought I'd share some of my thoughts. The first thing I have to say is that normally I never NEVER buy first generation gadgets. There are too many quirks to work out and they always end up being annoying. So why did I buy a Windows phone? Because I wanted something a bit different and it was the only phone that fitted that requirement. I was bored with my iPhone so was considering an Android phone, but they have the same grid based icon arrangement so I would be buying something very similar to what I had before. The Windows phone however used a completely different UI which I really liked the look of so I decided to break my own rule and took the plunge. The phone I bought is the HTC HD7 which has a massive 4.3 inch screen. It seemed big at first but I soon got used to it and now Victoria's iPhone seems tiny when I use it. The OS is very slick. It never stutters and seems to flow really nicely from one application to another. After a bit of playing about with it you easily get used to it. Nothing is hard to find and you are never left wondering how to do something. Internet Explorer is excellent, the mail application is superb, the calendar and messaging apps are also superb. In short I love this phone. Instead of having a grid of icons on the home screen Windows Phone 7 has what are called 'Live Tiles'. These are essentially big shortcuts to applications but they show useful information such as when mails arrive, what the weather is like, which music you are playing etc. It works really well. So, I like my phone. Does this mean there are no '1st Gen' issues? No. there are some. None are show stoppers but some are a bit annoying. The main issue I have, and this is the stupidest thing I have EVER seen on a phone, is that you can't connect to hidden wireless networks. This is not a bug but it is by design. I am hoping it is changed in the upcoming update. Secondly, you have a dedicated search button which is dynamic in that what appears when you press it changes according to what screen you are currently looking at. If you press it from the home screen it opens the brilliant (not kidding!) BING search screen, if you are in the marketplace (app store) it brings up the market search etc. My problem is that if you are in Internet Explorer it bring up the yahoo search page and there is no way to change it. WTF!? They have a brilliant search page in BING and they lock you to the shittiest one on the internet? Crazy. The third issue I have is that unlike the iPhone there is no dedicated mute button. You have to reduce the volume to zero. I think I have just been spoiled by the iPhone mute button as no other phone has one but I really do miss it. That is about it for issues. There are some problems with apps occasionally crashing and not supporting landscape view etc but that is really down to the app designer and not Microsoft and the apps I use are being updated so frequently that these issues are fast disappearing. The main improvement is in the Facebook app which was terrible at first but excellent now. There is an update to Windows Phone 7 coming any time now. It will apparently increase app loading times and fix some known bugs but to be honest I've not found many. So far this phone has been a pleasure to own and if I were buying it today, although I would have a good look at the lovely Nexus S I would still buy the HTC HD7.